My outdoor experiences include trips varying in length from one-day hikes to two-week trips. Most involve my three children. While my style isn't as 'high adventure' as some, I do enjoy the time we spend outdoors. My load used to be HEAVY - think pack mule. Now that the kids carry their own gear, plus the two oldest help carry the food, etc, my load is lighter. I go for durability over weight when selecting gear. organic lemongrass oil, 1 % rosemary and 1 % geranium. The Anti-Bug balm is a fairly solid, bees-wax based product. It is not greasy feeling, as are some products that contain oils. It has a pleasant garden scent that reminds me of my herb garden. I do not use DEET based products as I try to use the least amount of chemicals as possible. I am looking forward to testing the Anti-Bug balm and finding out how well it works on mosquitoes, and if it has any effect on ticks. Maine is well known for its mosquitoes, so I should have ample opportunity to put it to the test. We also are inundated with black flies (small, biting insects) in the spring. The actual testing period will be over by then, but I will write an addendum to this test in the spring. The product is what I expected from the website. The website explains the types of ingredients used, and that they are all natural and at least 70% certified organic. It also states that the product 'Meets EPA 25b Minimum Risk Exempt requirements'. Very simply stated, this means the product does not contain ingredients have been declared as a health risk at normal levels of use. I am anxious to test the balm to see if an all natural product can really fight off our mosquitoes. The balm is as described on the website. I plan on using this balm while hiking and participating in other outdoor activities. Not only am I curious as to how well it works when first applied, but how long it continues to be affective, and what it smells like on my skin. It has a pleasant scent in the container, but will it react to perspiration? I will also note how it feels on my skin - is it greasy feeling? I have a couple of weekend trips coming, the first being to the White Mountain National Forest. I also have a weekend backpacking trip planned with the Boy Scouts. Either the week before or the week after that I will be taking back to back day hikes of about 8 miles each (13 km). I will have a few more weekend trips between now and the end of the test period, along with numerous day hikes. Pretty much all of my hiking is in wooded areas, which provide plenty of 'buggy' areas. Our temperatures are cooling quickly, with our first average frost date the end of September. Day temperatures will drop from the current 75 F (24 C) to below freezing by the end of the test. October tends to be our rainy season, with first snowfall usually by the end of November. I appreciate the opportunity to test the Anti-Bug balm and thank both Badger Balm and backpackgeartest.org. 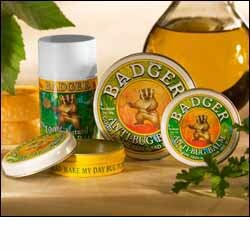 Picture is from the Badger Balm website. Over the last three months, I have had a few opportunities to use the Badger Anti-Bug Balm. I used it on three overnight trips, applying it late in the day, as the mosquitoes started appearing. The first time I was able to use it was on an overnight trip in the White Mountains. There had been quite a bit of rainfall two days prior to my trip, so there were some puddles of standing water which tend to attract mosquitoes. I applied the Anti-Bug balm to my hands, neck and ankles. I had long pants and a long sleeve t-shirt on, since the weather was only about 60 degrees F (12 C). I felt that I was fairly well protected from the mosquitoes - except along my hairline. I stopped and applied some balm along my hairline, and then cleaned off my hands on to my bandana. I then put the bandana on my head. For the rest of the late afternoon, and into the evening, I wasn't bothered by the mosquitoes. I reapplied before climbing into my sleeping bag. I woke up in the morning with out a bite - but had listened to them buzzing inside my tent throughout the night. On the other two trips, I had similar experiences, but admittedly there were fewer mosquitoes to deal with. I found that the balm felt okay on my skin - not greasy or oily. It didn't cause any irritation, and actually left my skin feeling softer after use. I think the smell is pleasant and has an herbal aroma. I also used the Anti-Bug balm while at two cook-outs, and a couple of soccer games. It did seem to help keep the mosquitoes away. I did notice others being bothered by the biters, but I stayed bite free. At one family party, I put some on my daughter, while my cousin put a deet-containing product on his daughter. Both girls stayed bite free - but my daughter definitely smelled better, and I felt reassured that I wasn't putting any more chemicals into/onto her than absolutely necessary. I am somewhat disappointed that I wasn't able to test this during the height of our 'buggy' season. Maine's state insect is the Black Fly - which is a horrible, tiny biting insect. It appears every spring, just as mud season is getting underway. It causes welts were it bites, that itch, then hurt when scratched. Since I have quite a bit of Bug Balm left, I will report back in the spring - once I have had a chance to really test the Anti-Bug balm. Thanks to Badger and Backpackgeartest.org for the opportunity to test this product.